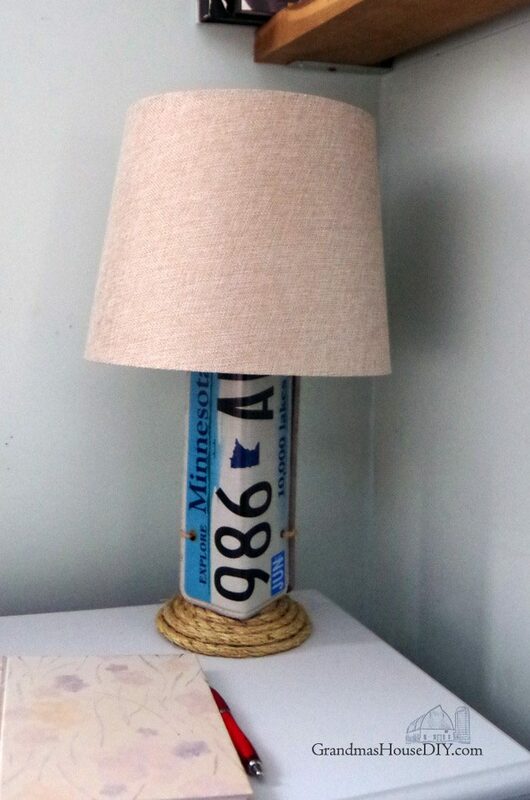 Lamp gets a country girl makeover using license plates! Before and After! 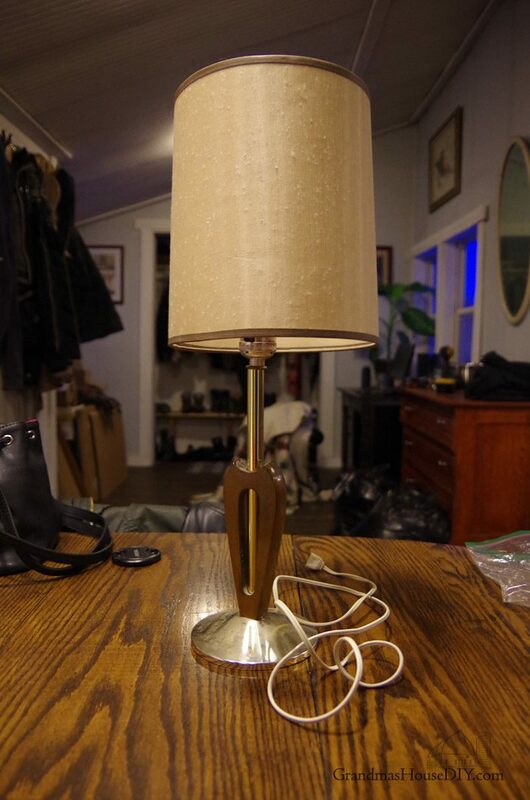 My new guest bedroom and library needed a reading lamp for the bedside table so, of course, I went thrifting! I found this little dude for only $6 and then went directly to walmart and found what I decided was the perfect burlap lamp shade. From there it was time to decide just how I was going to transform this little lamp into something country and fun! Using two old MN license plates I got to work! At first I had four plates to work with and I stood them up and tied them together making a rectangle. That was big enough to cover the round, gold base but it was WAY too big for the shade. So I kept the two license plates that were mine (my very first plates ever actually) and experimented trying to bend them. It worked easy! I bent each plate in half lengthwise by pressing them over the edge of my counter. 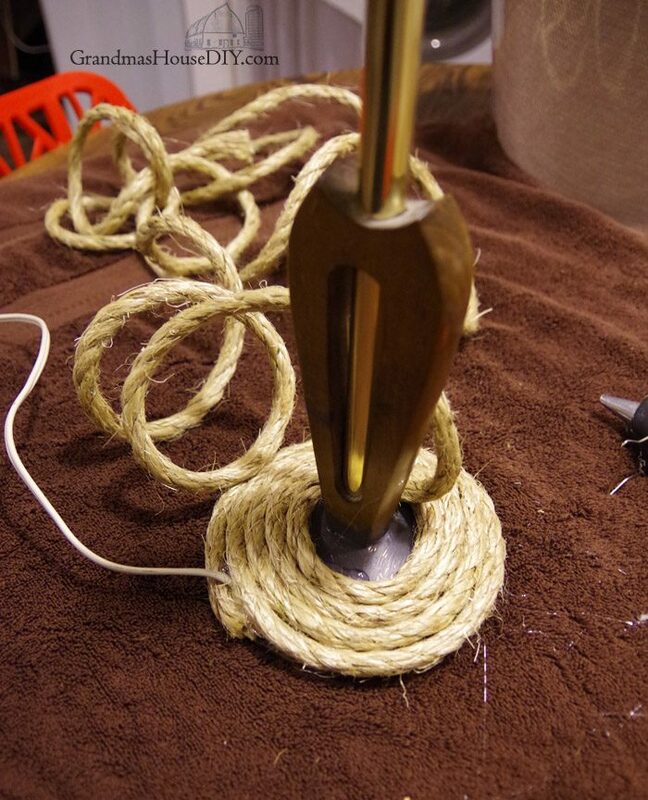 Then, using twin again, I tied them together into a much smaller rectangle and slid it over the top of my little lamp. Then it was time to figure out that ugly base! At first I was expecting to make a base out of wood but when I looked around my workshop for some ideas I ran into the big rope I used to hang my window planter boxes and it just seemed like the perfect fit! First I did a coat of paint on the base. (The paint is not perfect I just wanted to make sure that none of the gold would show through any gaps.) 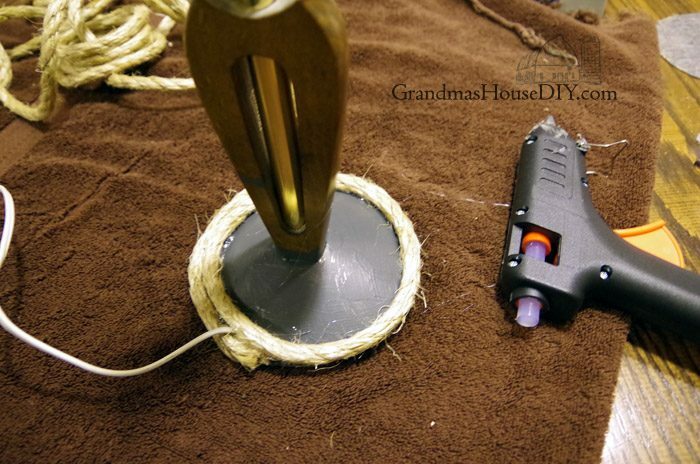 Then I used a glue gun and I simply wrapped the whole base up with that big rope. I am absolutely excited to see this little lamp transformed. All in cost was $6 for the lamp and $12.99 for the new shade at my local Walmart. The twine, paint and rope I had on hand and that was it! I think the lamp fits right in to my little guest bedroom. Not many more projects left now until I finally get to reveal it here on the blog! I am such a fan of your projects. 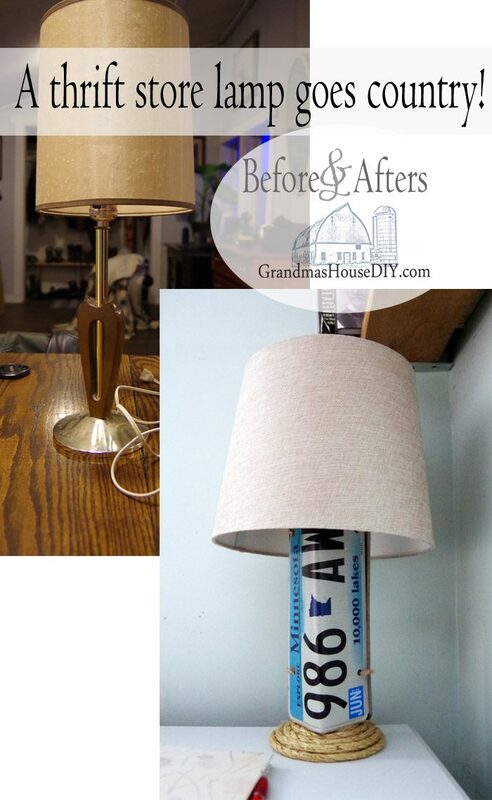 This lamp went from ugly to one of a kind fun. I truly do not know how you think of these things, but I love it. I am really enjoying your whole guest room makeover series, great stuff. Thank you so much Leanna! I so appreciate you coming by and commenting/checking my posts out! How creative. I love this! I do hope you’ll come back to the Fabulous Party and link. Love the use of the license plates. You have really interesting license plates in the US ours in the UK are really boring and wouldn’t be any good for any upcycle. Very cute! You found that lampshade at Walmart??? Tempted to drive there now! Hi Audra, yup I found that shade and a little pillow that matched it just perfect at Walmart one day! Awesome! Thanks for coming by!! 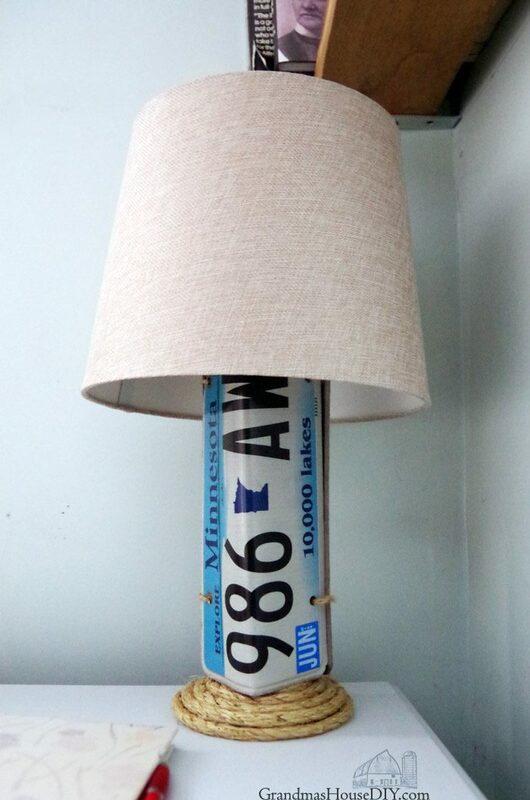 That really transformed the lamps! Thanks for sharing with Party in Your PJs! Think we still have 2 old MT license plates out in shed. How we drug them with us from KY who knows but am glad we did. It’s all we have left of MT. Will use those plates to redo a lamp out in old Suburban.Sub doesn’t run but is sure handy for my own personal storage for my books and etc. Since Mr.Furry always threatening to throw my goodies away, him and youngest daughter..
Can hardly wait to see reveal of your guest room, you are such an inspiration. Hi there, someone told me that we’re not supposed to keep old license plates? I certainly don’t know why not! lol I’m really glad I have my first plates off my first car, there’s something really nostalgic about them! What an absolutely wonderful idea. I would never have thought to do that. Tara, this is just fun! I’ve been looking around for ideas since my brother left me his license plate collection, and let me tell you this would just do amazingly in my living room. People always think escorts time out in London consists of endless partying, but honestly – home improvement is my niche! Thanks for sharing this tutorial. Thanks Riley for coming by!